Kicking off the North American leg of their tour, in support of their recently released new album Anchor, Zammuto brought their brand of off-kilter electro-rock to the Casa Del Popolo on Saturday (September 6). 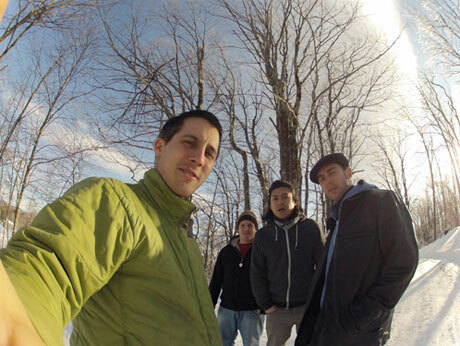 Nick Zammuto is no stranger to the North American indie rock scene, having founded and performed as the influential American folktronica band the Books for the better part of the early oughts. But only with his newest endeavour, the eponymously titled four-piece Zammuto, does his sound feel fully realized. Alongside his bandmates on bass, electric guitar and drums, and on synths himself, Zammuto managed to sound dead serious and completely ridiculous at once. With backdrops featuring an alternating slideshow composed of winter scenes, infomercial-type silhouettes of back pain sufferers and '80s b-movie outtakes, you could be forgiven for thinking that the band were taking the piss. But while these distractions may have initially been somewhat frustrating, they eventually became part of the concert's inherent charm. Their live set allows for a much better representation of their recorded material; the differences in style between tracks become a lot less jarring when heard with live instrumentation, especially with Sean Dixon's impressive drumwork. While the set was comprised of many songs included on Anchor — including standout "The Great Equator" — much of the set was reserved for songs not deemed fit to be part of the project, including "Code Breakers" and "Corduroys." Their inclusion in the live set demonstrated a willingness to delve deep into their sound without being restricted to pre-approved material. While their performance did little to clarify where Zammuto stands as a standalone project, it did cement the band as one excited to explore the multiple facets of their sound. Opening band Saxsyndrum, a local experimental electro-jazz outfit composed of saxophone, drums and violin, only furthered this exploration into non-traditionally defined musical genres. Saxsyndrum clearly have a strong local fanbase, with the Casa Del Popolo seemingly reaching capacity during their set, and then somewhat thinning out for the main act. Having already performed throughout the city and its festivals, including POP Montreal and Passovah, they've racked up a loyal and passionate audience, one that'll surely follow them as they continue to develop their sound.